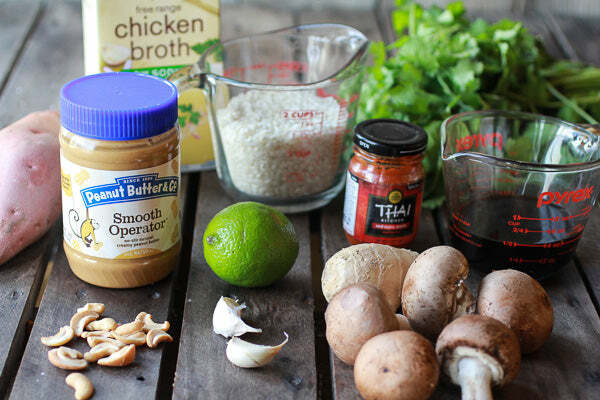 One of my favorite ways to incorporate peanut butter into dinner is with Thai cooking. 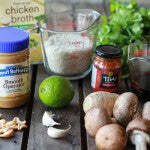 My family loves a really good coconut based peanut sauce with a little spice. I have been known to put peanut sauce on pretty much anything. 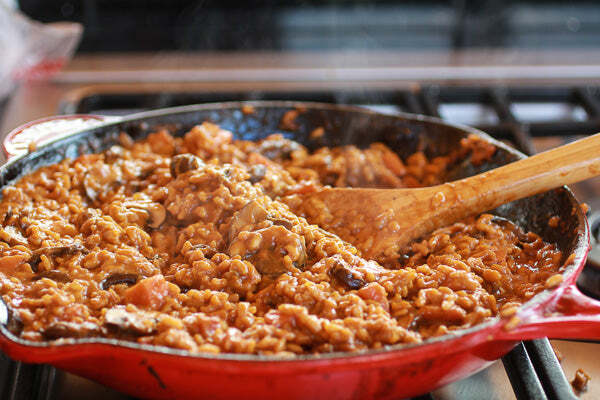 Pizza, pasta, sandwiches, burritos, spring rolls, quesadillas and now, risotto. 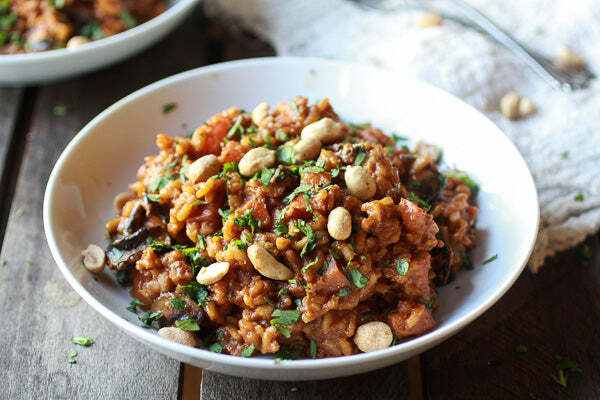 I took some of my favorite ingredients that are used in a lot of Thai cooking and added them to this risotto along with a healthy sweet potato and some cremini mushrooms. It is a healthful dish, and full of flavor. 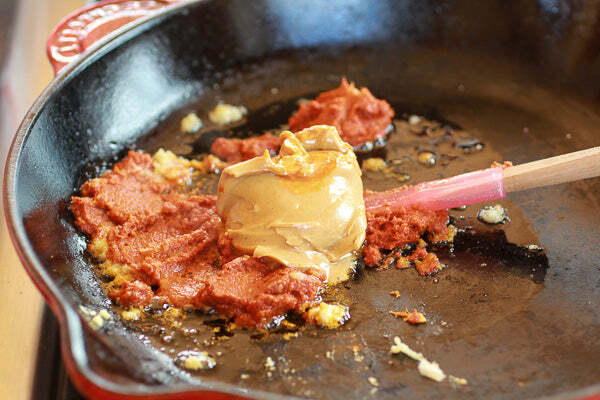 Any peanut butter lover is sure to love it! 1. 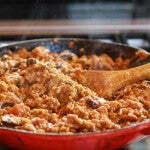 Heat a large saucepan or a Dutch oven over medium heat. Add in peanut oil, then add the ginger and garlic with a pinch of salt. Stir to coat and cook for 30 seconds. 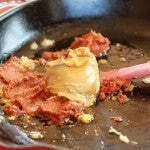 Add the Thai red curry paste, peanut butter, smoked paprika, and brown sugar, stirring into a thick paste. Cook for another minute. Add the rice, sweet potato and mushrooms, stirring to coat. Cook for about 3 minutes, stirring 2-3 times until the rice is translucent; if things are sticking add another tablespoon of peanut oil. Reduce heat to medium-low and add in the soy sauce and coconut milk. Continue to stir as the rice absorbs the soy sauce. When most of it is absorbed, add in about 1/3 of the chicken broth. Repeat the process, continuously stirring until the broth is absorbed, then add another 1/3 of the broth. Repeat until all of the broth is used and absorbed and the rice and sweet potatoes are cooked. The whole process will take about 30 minutes. 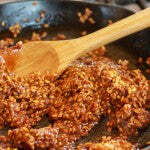 If the rice is still too chewy and dense, add more liquid, stirring again until absorbed. 2. Add the lime juice, stirring until incorporated. 3. 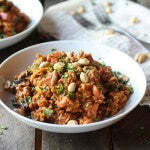 To serve, plate the risotto and garnish with fresh chopped cilantro and peanuts. Serve immediately! 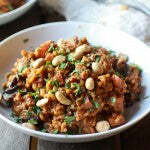 Tieghan uses risotto in this recipe. 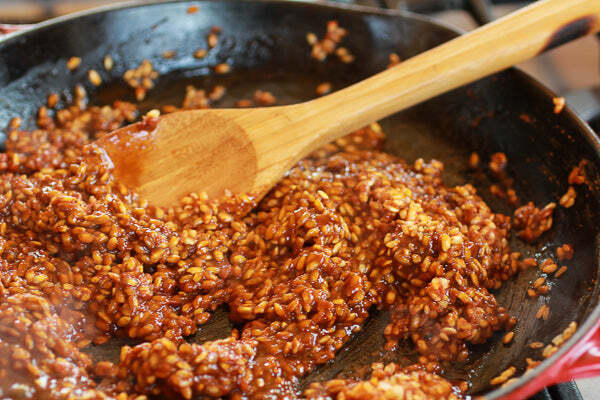 What other grains would you pair this coconut based peanut sauce with? – The giveaway is open to USA residents only and will run until Monday, February 24, 2014 at 11:59 PM EST. – Winner(s) will have until 02/27/14 to claim their prize or we will choose another winner. 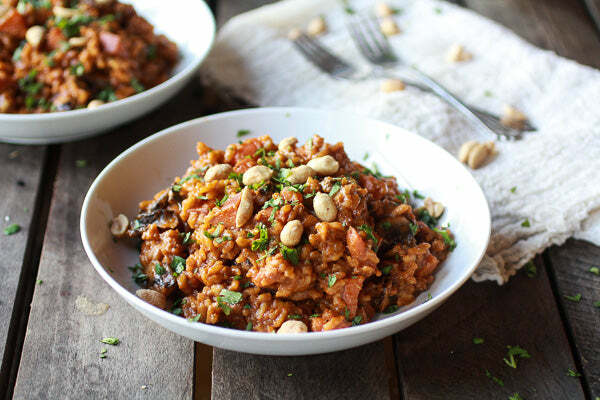 The post Thai Peanut Risotto appeared first on - Peanut Butter & Co. Recipe Blog.